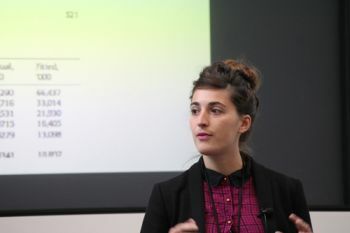 There was a variety of presentations at the annual networking event for early stage data researchers. Organised by Lecturer in Mathematics, Dr. Andrea Baronchelli, and City Department of Mathematics PhD students, Laura Alessandretti and Abeer Yehia Elbahrawy, Data Natives is an annual networking event for early-stage researchers who are enthusiastic about data. For the third edition of Data Natives on Friday, April 28th, 90 attendees and 20 speakers from 11 international universities took part, drawn from the academic and industrial spheres. The prize for Best Contribution to Data Natives - selected by a jury of world-leading data science experts - was won by Chanuki Seresinhe, a PhD researcher at the University of Warwick and The Alan Turing Institute for Data Science. Chanuki's prize was sponsored by the Nature Publishing Group's journal, `Scientific Data’. 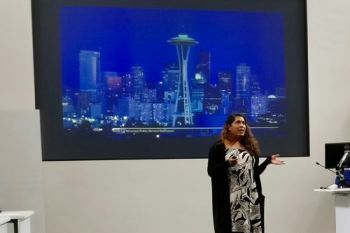 Her presentation was titled, “Using Deep Learning to Quantify the Beauty of Outdoor Places”. Data Natives is part of a series of initiatives organized by Dr. Baronchelli, founder and coordinator with Dr. Nicola Perra (University of Greenwich) of the London Computational Social Science Initiative and a co-organizer of Databeers London.